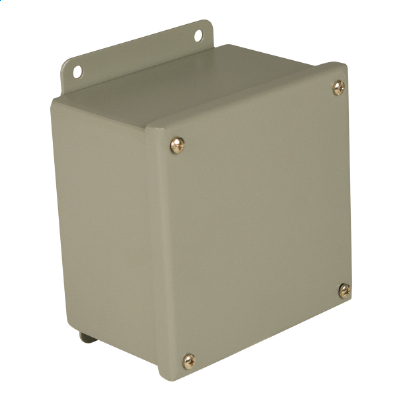 Designed for use as instrument housing, electrical control enclosures, terminal wiring boxes or electrical junction boxes. Provides protection from dirt, dust, oil, and water.Bodies and doors fabricated from 14 gauge steel. Continuously welded seams ground smooth, less knockouts of holes. Lids are sealed with closed cell oil resistant neoprene gasket. External mounting plates, top and bottom of enclosure. Captivated cover screws are provided which thread into sealed wells to prevent leakage through cover. Grounding provisions provided.